On President Lincoln’s iconic speech, The Patriot-News of Harrisburg said yesterday that, “In the fullness of time, we have come to a different conclusion”. A US NEWSPAPER has issued a retraction for an editorial written 150 years ago dismissing President Abraham Lincoln’s Gettysburg address. 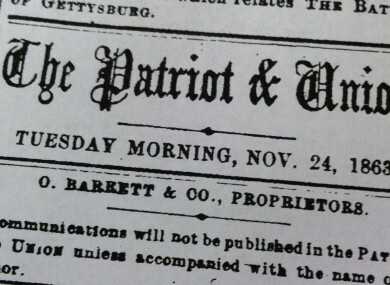 The Patriot-News of Harrisburg, located about 35 miles northeast of Gettysburg, issued its retraction for the editorial penned by its Civil War-era predecessor, The Harrisburg Patriot & Union. By today’s words alone, we cannot exalt, we cannot hallow, we cannot venerate this sacred text, for a grateful nation long ago came to view those words with reverence, without guidance from this chagrined member of the mainstream media,” the paper wrote, echoing the words of the address. Email “A US paper that called the 1863 Gettysburg address 'silly' has issued a retraction”. Feedback on “A US paper that called the 1863 Gettysburg address 'silly' has issued a retraction”.